As one of Sheffield’s oldest independent charities, SRSB is gearing up for its 160th Anniversary which will be in 2020. Our charity has been providing vital services for visually impaired people in the city since 1860. 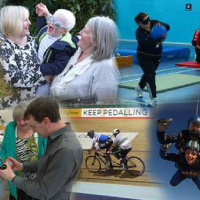 Over the last 159 years we have helped people to come to terms with their sight condition, offering a range of activities and advice, and working with many other organisations both locally and nationally, to improve the lives of people with sight loss. We have had to adapt to many changes since 1860, and one of our most significant changes in recent years was the demolishing of our old building on Mappin Street, which was replaced by a purpose built new centre which they moved into in 2009. Even more recently in 2017, we took the step of extending our services to Rotherham and the new, much needed sensory service, has been very well received by the town’s hearing and/or sight impaired people. The Rotherham Sight & Sound (RSS) centre was set up with the support of a contract with Rotherham Council, however the Sheffield charity is completely self-funded. SRSB has a small staff team, however, we are extremely lucky to be supported by a team of over 160 dedicated volunteers, without whom, we could not provide the range of activities that we do. Deputy General Manager, Joanne Ardern comments “We are here to support our clients at every stage of their sight loss journey. We run a Little Sparklers Pre-School Playgroup, a Youth Club, support a wide range of user led sports and leisure groups, hold a daily Activity Centre, host support groups and meetings as well as organising many social activities.